Ever since London was just two weeks old we have been what I like to call “road warriors!” She was born July 1st, just a week before her Daddy’s busiest travel month of the year so I learned pretty quickly that if I wanted help, I would have to get accustomed to traveling with baby in tow! Now that we have added Malia to the mix, trips have gotten a bit more interesting! Pack ALL the snacks. Seriously…all of them. You can never pack too many. London once went through an entire bag of “Yogi’s” (freeze dried yogurt drops) on a trip. As far as I’m concerned, all bets are off when you are in the midst of any sort of travel situation; car, plane, train, etc. Some other snack ideas are: graham crackers, pb&j, banana, cut-up fruit, squeeze apple sauce (if you think your toddler can handle this on their own), raisins, goldfish, animal crackers, and LOLLIPOPS. I like to keep a stash of dum-dums in my car at all times for a little “pick me up” when it’s REALLY hitting the fan! Make a special playlist. This applies to London, since 7-month old Malia doesn’t have a choice. Lo LOVES music. She could probably sing and listen to her favorite Disney princess songs over and over again the entire ride. I would go a little nuts, so I like to make a special list and build it up to her the morning of our trip. I usually say, “Oh, London! I have an amazing music list that I put together for you for the drive…I’m so excited!” That’s typically all it takes to pique her interest. While we’re on the topic of music - don’t hesitate to blast some good old static from the AM stations if your baby is starting to lose it in the car. If they have a full belly and a fresh diaper - they’re probably just over being in the car and honestly, the static sounds like white noise and usually can calm them down slash drown out the noise a little for you! Invest in SAFE and comfortable car seats. Let’s face it - this is the most important on the list! If you’re driving any sort of distance you want your kids to be comfortable AND hello - SAFE! We recently switched London to the new NextFit Zip Max by Chicco! The convertible car seat transitions from rear-facing to forward-facing to accommodate children from 4 pounds all the way to 65 pounds and what I love is that if we decided to use it for Malia - it allows for extended rear-facing up to 50 pounds! I always think, UGH my poor kids, their knees are in their chest when they’re rear-facing but it really is the safest position for them and the NextFix Zip Max offers 25% more legroom in rear-facing mode than other Chicco models! It also has extended calf support in forward-facing mode, which is a huge bonus. I actually took a photo because I wanted you guys to see what I’m talking about with the leg support/more leg space! I always seem to have a difficult time installing car seats but I feel like I can actually handle this one! You can achieve a tight fit using a vehicle seat belt or LATCH connector thanks to the SuperCinch feature, which is a force-multiplying tightener that helps secure the seat with less effort. ALSO worth mentioning because kids are messy :) … the car seat has a zip-off machine washable seat pad so you know, when a yogurt or applesauce inevitably explodes in the car, it’s not the end of the world! The NextFit Zip Max is available online at ChiccoUSA.com and in select stores for $369.99, but the entire Chicco NextFit line was recently upgraded and also features additional models at a variety of price points to fit every budget. Screens are your friend. As I mentioned before, all bets are off when you’re traveling. I love to have a few of London’s favorite shows locked and loaded on the iPad. She is currently obsessed with Starfall ABC, which is a free educational app that’s on my phone so I put that on the iPad as well. We also like to play a few games to buy time. “I Spy” is always a huge hit and can usually eat up at least 15 minutes. I also like to get Lo looking out the window at the view / whatever we are passing. I literally say “tell me what you see” and she describes what she sees and then I do the same. We also like to name each color car that passes. These sound like the simplest of games and they really are - but they’ll help pass some time! Plan a pit-stop if you need a break. We seem to always be driving north so I know a lot of the rest stops on the way, but if you’re driving somewhere and you don’t know the route, make sure you map it and check for safe places to pull over if you need to. Speaking of safety, always check the weather a few days before! I forget to do this all the time and there’s nothing worse than planning your trip, packing the car and then realizing the weather is terrible. It’s happened to me too many times! Where is your next road trip?! I think we may be going to Maine again in the near future but also want to take the girls to Burlington, Vermont next month too! What are some of your own ideas you can share with me to make our road trips even smoother?! This post is sponsored by Chicco. As always all thoughts and opinions are my own. This weekend in Boston was SO beautiful and I couldn’t have been more happy to finally venture outside in just a t-shirt! I’m pretty sure London was the happiest of all - but it was just so amazing. We tried to get outside and enjoy it as much as possible…because this week looks like rain, rain, and more rain! I’m just holding on to the age-old saying “April showers bring May flowers” because I need to believe more sunshine is ahead! Here are some cute things for Spring that you should totally check out! A lot of them are currently on sale, so hurry! I can’t believe our Disney trip has come and gone! We had been planning to go as a family for a year and there was so much excitement and anticipation leading up to the week! My parents have a time share at Disney’s Contemporary Resort, which is where we always stayed growing up as kids. It’s SO fun to go back now and bring our own children to experience all of the fun and magic that Disney encompasses! 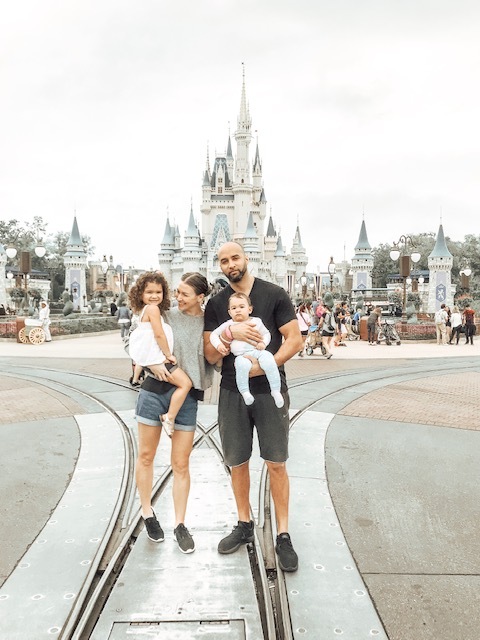 My sister and her family came on the trip as well - and we all stayed in a three-bedroom villa which was absolutely gorgeous with views of Magic Kingdom; we watched the fireworks every night from our balcony…it was amazing. While we were there I got LOTS of messages from people saying they had a trip coming up and were super nervous/wanted tips etc. All I have to say is YES, Disney is a BEAST of a place and it’s completely exhausting, but it’s ALWAYS worth it. If you go in with a few tips + tricks and a plan, then you will dominate it! 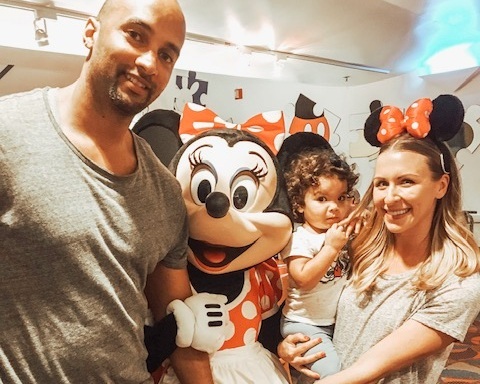 This was London’s third time at Disney World (she’s 3.5 years old) and each trip gets better because she remembers more and more. The look on her face makes it me so happy. Bringing Malia added a new layer and definitely took more thinking in terms of coordinating naps, mixing bottles etc., but it was absolutely amazing and I’m so glad she experienced it with us. 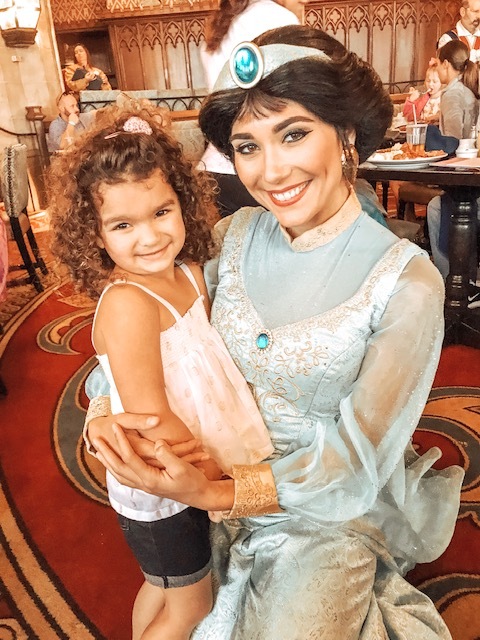 I know people say “I’m not going to take my kids to Disney until they can remember it” and I get that, but for us we just feel like the entire process of travel in general brings new learning experiences for our children and opportunities for them to grow, step outside of their comfort zone, and expand their minds…plus THE MEMORIES. Bring your own snacks and waters to the parks. Unless you want to spend $5 on a bottled water I recommend you pack your own! They let you do this so we stashed 4-5 waters in the storage bin of the stroller. I also pack a bunch of snacks in my luggage or buy snacks at a store outside of Disney when we arrive. I bring individual packs of goldfish, raisins, cheez-its, apple sauce pouches, etc. Plan Fast Passes in advance. If you want a super popular ride like Peter Pan’s Flight at the Magic Kingdom, I would book a fast pass ahead of time for this! We did our fast passes a few days before our trip and we were able to get on all of the rides / see all of the shows that we wanted too (I made a list below of our favorites by theme park). Bring your own stroller. I don’t recommend renting a stroller there - mostly because they look SUPER uncomfortable and there’s no storage underneath (which I count on). As of May 2019, there are new standards for strollers in terms of length and width, so make sure you check on the website before you pack your own. I’m sure the travel umbrella strollers would work fine. My sister has an almost two-year old and they used something similar to this one. We love the Babyzen YOYO stroller (as I have mentioned a bunch before) and they have an attachment/ride along board which is AMAZING! Utilize the Baby Care Center. They have these in all four theme parks and they’re wonderful. There is a private nursing room with rocking chairs, a place to change your baby and highchairs to feed older babies as well! There is also a shop that sells formula, diapers, sunscreen, wipes, baby food, etc., should you have forgotten any of those things. We spend the most time here every year, for obvious reasons - it’s the main park! There are amazing rides but also daily parades and shows! Here are our favorite rides/shows to see! *I HIGHLY recommend the nightly fireworks show! London is 3.5 so we had her take a later nap so she could go (It starts at 9:15pm), but it is SO beautiful and worth it. London was completely mesmerized and honestly, so was I! We LOVE Animal Kingdom. It is so beautiful and probably my second favorite park after Magic Kingdom (It’s my husband’s favorite!) We never do many rides here because we’ve only always spent a half a day…but our top 3 are listed below. It’s just SO beautiful! The photo below of London meeting Pocahontas was when she was 2.5 years old - she loved it! I hope you’ve found this helpful! If you have any questions you can post them here or on my latest Instagram post (not the giveaway) and I will probably be able to respond quicker! Love you all! I hope you are all having a great week! Hey guys! I feel like I haven’t posted much the past month or so because it’s been so insanely busy! We went on two trips in March and just recently took both girls to Disney World…so needless to say - we are kind of exhausted :) I ran a poll on my Instagram to see what you guys wanted for content; a “how to” when it comes to Disney with kids or prepping to fly with two and it was pretty even so guess what - I’m going to do both! I ALWAYS make a list. This time I made one for each child and divided it into things I need for my carry-on and things I need to pack in general. I brought two carry-ons which seemed to work nicely. I did one backpack and a shoulder bag. I hesitated on the shoulder bag but it was actually clutch because it was already open and easy to access PLUS it fit underneath my stroller, which I always use through the airport (I’ll get to this later!). A bag like this would work nicely and I really like this one because of the attached wristlet! Before I go ahead and list everything out - I HIGHLY recommend not just throwing everything in, but organizing things in gallon-sized ziplock bags. This helps IMMENSELY when it comes to fishing things out of the bag efficiently. Do you check your stroller? …What do you do with your pack n’ play? … Did you wear one child and push the other in the stroller? … Which carrier do you recommend? These are just a few of the questions I get asked when I travel with London and this past time with both girls. Firstly, having a GREAT STROLLER makes all the difference and I always GATE CHECK my stroller which means I take it through security and use it to maneuver around the airport then check it right before we board! It is FREE to gate check (at least with JetBlue) and just makes life SO much easier. If I’m traveling with just London, I always use my Babyzen YOYO stroller which folds up, has a shoulder strap like a purse, weighs just 15 pounds, and can fit in the overhead bins of any airplane! Most recently when we traveled with London (3.5 years) and Malia (8 months) we used the Chicco Bravofor2 LE Double stroller and it was MVP of our trip, FOR REAL. London has the option to sit or stand while Malia sits in the front. London fits in the front too, which she loved to do when Malia was in the carrier. The storage bin underneath is HUGE which is another bonus considering it left room for my shoulder bag and carrier when I wasn’t using it. It also folds + unfolds in probably five seconds - no exaggeration. When is comes to my 4Moms Pack n Play - I always check it underneath the plane and we never have any issues. I bring this when we travel (even though most hotels have their own), because it’s bigger than the standard pack n play … and almost the size of a regular crib! When going through security I recommend baby-wearing because oftentimes they do make you fold up the stroller which kind of requires two hands. I wore Malia in the Ergo 360 carrier from the time we got to the airport until we got through security. I like planning flights with the littlest one’s naps. This was pretty easy considering Malia still naps 3 times a day. She slept on the plane for an hour both ways, which was a huge lifesaver! I recommend getting to the airport with plenty of time to grab a few waters, hit the bathroom for the potty and a final diaper change before boarding. I also like to let them get their wiggles out and run around a little bit beforehand, since they won’t be able to move around much on the flight. For those of you who follow along here or on my IG, you probably know by now how much I love Maine and how much we, as a family, love to visit Kennebunkport! It’s so special to us for so many reasons. We have vacationed there together for the past 6 years, we got engaged there, my sister was married there and my brother will be married there this October! Ahhh!! So many memories. Anyway, I am a contributor for the Boston section of Mommy Nearest - and recently wrote an article for them about all the things you can do in Kenebunkport!! I wanted to share it with you guys - so you can check that out HERE! Since we’ve been traveling a lot this month - I thought I would share what I like to wear to the airport/on the plane. I ALWAYS opt for comfort, especially when I’m traveling with the family - so my Nike Roshe’s are my go-to sneaker. I have them in black/white and also white/white. They’re so ridiculously comfortable! I posted a photo of the black roshe’s below and also, I usually get lots of questions about this leather jacket too. The hood is removable - and I love that because it makes the jacket dressier for a night out and more casual with the hood! These spanx leggings in the picture above are always a hit as well - THEY’RE AMAZING. They completely hold everything is but are SUUUUPER comfortable at the same time. They’re faux-leather so they’re perfect for a night out too…but can be dressed down as you see above. They’re actually comfortably enough to travel in - and I bring them on every trip because they’re multi-purpose! We have another trip in just 10 days and we’re going somewhere SUNNY and tropical, so I’ve got my eye on a few jumpsuits I think would be great to travel in. I like this one that’s sleeveless! I can wear a cardigan or my denim jacket over it and then when we land, I’m dressed appropriately for the warm weather. I also just love the ease of jumpsuits in general. ASOS always has some great options! Here are a few other things that I would LOVE to travel in…and highly recommend for you if you have a trip coming up! Stay tuned for where we will be going next! We have been living in Boston for almost five years now and have completely fallen in love with the city. When we first moved here Chris and I were newlyweds and we got our first apartment together in the cutest neighborhood of Boston (in my opinion), Bay Village. It is sandwiched between the South End and Back Bay - which are home to some of our favorite spots in the whole city. We only lived downtown for one year - but I like to think that we made the most of exploring and discovering all of the things that make “the Bean” so amazing. Now that we are parents of two, we have spent the last few years taking advantage of all the things that the city has to offer for KIDS! I wanted to share some of our favorite spots in and around Boston; our go-to parks, restaurants, museums, etc. so if you guys are ever visiting or even currently live in the city, you can check them out! Boston Public Market: This is one of our top places to go on the weekend but it’s Monday - Friday as well! Some of our favorite spots are here…all in one place. We get our coffee at George Howell, always make a stop at Red Apple Farm (for homemade apple cider donuts), and London and I pick a few flowers from Field & Vase by Stow Greenhouses to make our own bouquet. Also, how good is this backpack that attaches to my stroller? It’s the Papago from J.J. Cole and I love that it holds everything I need - literally I always pack my LIFE when I go out with the girls and want to make sure I have everything - this backpack holds it all! We love the Boston Public Market! This is Field & Vase where London and I love to make our own bouquets! Blackbird Doughnuts: These doughnuts are so good! They’re delicious, they’re made in-house and they make these mini cinnamon sugar stacks for your little ones too! If you’re feeling up for it, try the “made-to-order” ice cream sandwich! Faneuil Hall: So fun to go here as a family! They always have fun street performers to keep kids entertained and you can grab a delicious meal in Quincy Market! Boston is such a walkable city and I love that I never have to worry about Malia being cold on these chilly winter days because of the BundleMe that keeps her super snuggly! I also don’t have to bring any additional blankets which is a major MOM WIN, am I right?! Beacon Hill: You HAVE to visit Beacon Hill. It is quintessential Boston with the adorable tree-lined streets and beautiful brownstones. There are some of the cutest shops and cafes in this neighborhood also including Tatte, a beautiful space with a cozy feel and open kitchen to watch the chefs whip up tasty sandwiches, soups, delicious pastries and more! Make sure you walk by Acorn Street, which is known as one of America's most beautiful streets and easily one of the most Instagrammed spots in Boston. Also, a little tip: you'll have better luck in flats trying to maneuver your way up or down this street. And best to ditch the stroller beforehand, too. How cute is Malia on Acorn Street, one of the most photographed streets in America! Love exploring Boston with my girl in her cozy BundleMe! Charles River Esplanade: Grab a coffee and head over to The Esplanade for a relaxing walk and scenic views of the Charles River and cityscape. The Esplanade Playspace is a place your kids will love too and a great way for them to burn off some energy! Newbury Street: Newbury is the city's most popular street for shopping! There are so many trendy cafes and restaurants to power you through a shopping spree (if your kids will allow it). One street over on Boylston, you’ll find the Boston Children’s Museum if your kids need a little escape - or you can head to our favorite Newbury spot, Georgetown Cupcakes. London always picks the cupcake with the MOST frosting…can you blame her?! London loves all of the pretty store-fronts on Newbury! Waiting patiently for her cupcake! New England Aquarium: Pretty self-explanatory, but aquariums are always a hit and this one is really fun! It’s also a short walking distance from Faneuil Hall so you could do them both in the same day! London loves to run around the museum and we have been so many times that she knows where everything is! The photo on the right is a new exhibit (that’s a true-to-size SEAL by the way), and I love that they are always changing up exhibits and bringing new/interesting things to the museum for people like us that visit so often! *Mom Tip: A backpack always works better than a shoulder bag. You need both hands - especially when you’re the solo adult with two little ones! We love our Papago! The “Science in the Park” exhibit is GREAT for kiddos to burn off some steam and run around! London could stay on these swings for hours! Fenway: You can't visit or live in Boston and not take at least walk America's most beloved ballpark; that would just be unpatriotic! Catch a game for a photo of the “Green Monster” or just pay a visit to capture the essence of this legendary place. If you’re looking for a yummy place to eat, Sweet Cheeks Q is a super popular place basically next door! There you have it, that’s my list! What are some of your favorite places to take your kids in Boston?! I’d love to hear more ideas / recommendations … we are always looking for more adventures! This post was sponsored by JJ Cole. As always, all thoughts and opinions are my own. I think this is my most sought after blog post! I have had so many people message me on Instagram about when I’m going to show “before + afters” of my eyebrows now that they’re microbladed and asking SO many questions about the procedure in general. Well, HERE IT IS! I wanted to wait a few weeks to let the eyebrows CALM THEMSELVES DOWN a bit because let’s be honest when they’re first done they’re CRAY. They’re dark, you can’t get them wet or touch them…it’s just a SCENE. About three weeks later and I’m absolutely LOVING the way that they look. I don’t even know how I was rocking my sad eyebrows before this or what took me so long to get this done! SO HAPPY WITH THE OUTCOME! Brows are created using a tiny scalpel with multiple blades, which are then dipped into pigment before making the individual, tiny cuts into the eyebrows. The pigment isn’t applied as deep into the skin as with a conventional tattoo, so this method is deemed semi-permanent. Meaning: It should last around two years, depending on skin type and how it was applied. How Do I Find My Technician? Rejina from Boston Perfect Eyebrows in Allston did my brows. She has been doing this for over three years and after researching her website and her Instagram page I felt really comfortable trusting her to do mine! Everything was VERY clean and sterile. She is patient, thorough, and takes her time. She is super sweet and dealt with my nervous self so graciously. Also, she is the CUTEST human. Make sure your technician is properly certified and licensed people! This is nothing to mess around with - HELLO these are your brows and a semi-permanent tattoo. Do your research!! Short answer: Not really. Longer answer - I’m a BIG baby and told Reji from the beginning that I didn’t want to feel anything. Honestly, the threading at the beginning was the worst part, if that says anything! Ha! She put numbing cream on my eyebrows and during the first pass of three - I didn’t feel one thing. The second pass I started to feel a little bit of a burning feeling so Reji put more numbing cream on. I love that she took her time and was patient in allowing me to do that! Do they use a needle to numb you? I know I just mentioned this above but I got this question a lot! NO they don’t use a needle to numb - they use a CREAM. Score! What is the healing process / after care like? Basically you can’t get your eyebrows wet or really touch them for 2 weeks. For the first week, I was instructed to apply a thin layer of ointment on my brows. It was a little annoying mainly because I couldn’t work out (due to sweating) but honestly - not terribly difficult and TOTALLY WORTH IT for two years of rockstar brows if you ask me! How do they find your shape? What is the maintenance like after the two weeks? Please feel free to message me on Instagram if you have any questions!! If you want to check out Rejina’s instagram, you can click here! It’s that time of year again - Conference Tourney Time for my husband’s basketball team (Go NU!) and I’m heading back to Charleston with London for a few days! I have been looking forward to this trip with her ever since I booked the tickets in December .. and I think she is JUST as excited. Traveling with her is a blast - and we always have such a fun time together. This will be the 13th flight she has taken and each time gets better and better - probably because she’s getting a bit older! It’s like going on a little trip with my bestie! I wanted to share some "must haves" when it comes to toddler travel… 3.5 years old is still considered “toddler” right? Let’s go with it :) I know traveling can feel stressful and exhausting at times, but I think if you try to make it as fun as possible than they will feed off of that energy. First things first...I highly recommend traveling with a BACK PACK as a carry-on and not a mini backpack…a pretty roomy one because you’re going to need ALL THE THINGS. That’s just the way I personally like to fly anyway because, better to be safe than sorry! I really love the Papago from J.J. Cole which we just got, this one by Skip Hop and if you’re looking for a cheaper version, this one is under $70. The next thing that's a "must have" is a lightweight, compact, and easy to fold stroller. Our BABYZEN YOYO+ stroller is an actual lifesaver and I can't say enough about it. It's folds up in literally five seconds and is small enough to fit in the overhead compartment on the airplane. Once it's folded, it has a shoulder strap for easy carrying and it weighs just 15lbs. I can't tell you how many people comment on it when they see us fold it up or open it; just how easy it is! There's also a pretty convenient compartment underneath to store small items if needed. 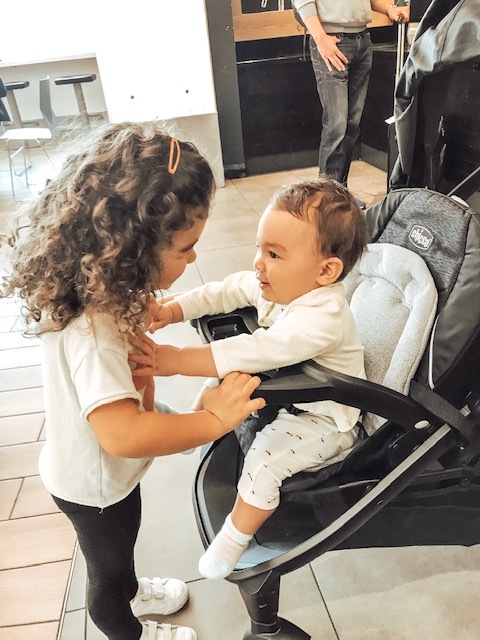 If you’re looking for a double stroller for two kiddos, we have been using the Chicco Bravofor2 LE Double stroller and really love it for the ease of folding/opening and the storage underneath! I typically like to time flights so they’re during London’s nap time. Now that she’s older I just booked the cheapest flights…which is nice :) She does still nap, but will be able to handle a missed nap for one day. Prior to flying, I alway hit the Target Dollar Bin for some activity books, sticker books, and anything small I can fit in my carry-on backpack for her. I pack a few of her favorite snacks, books, plane-friendly games, and of course – the iPad. Lo is old enough to understand how headphones work and she loves wearing them. I got these Mpow Kids Headphones for this trip - and they’re great. I also just downloaded ‘Starfall ABC’ to my iPad for our trip because it’s an educational game that you don’t need wi-fi to play…and it’s free! Important tip: I highly suggest bringing a travel pack of Purell Sanitizing Wipes. It gives me peace of mind to wipe down the germ-infested airplane. I also bought the travel-sized Purell to attach to the strap of my backpack. I cannot tell you how many times I use this throughout the day when we travel! Blackout shades; these are cheap paper shades that I always travel with. Actually I just keep them in my car. I use them when we stay at friend’s houses, hotels if needed, etc. They’re easy to fold and carry in your suitcase. 4Moms Travel Playard: Hands down, best ever and easiest set-up. It comes with a travel bag so we just usually check it in for the flight. I’ve struggled HARD with other pack n’ plays, but this one is absolutely AMAZING. Sound Machine; Another thing I never travel without is this $20 plug-in sound spa. You never know what the noise level will be at the hotel so I prefer to make sure unnecessary things don’t wake my babes! Doesn’t take up a lot of room in your luggage either! Lastly, as far as I’m concerned all bets are off when traveling. Screen time increases, the amount of snacks can go through the roof and I’m not above a good dum-dum lollipop bribe! You just do what you have to do, knowing that things will return back to normal as soon as you reach your destination! The moral of the story is to HAVE FUN and try to enjoy what can sometimes be a stressful experience, but doesn’t have to be! I hope this is helpful for any of you that’ll be traveling with toddlers soon! Make sure to follow along on my Instagram to see our adventures over the next couple of days! Happy Wednesday! I hope you’re all having the best week! Here are some cute styles on sale NOW! It has taken me 3+ years to get to a place where I feel like I have somewhat of a clue when it comes to curly hair! I have completely straight hair so it’s definitely been a learning curve! I’m not an expert AT ALL so I’ve asked lots of questions about products, researched products, a little trial and error to see what works and I finally think we have a concoction that’s working right now! I typically wash London’s hair 2x a week. I found that if I washed it more it would dry it out, so twice seems to work well. I shampoo her hair once and condition it twice. I found that on the second pass of conditioner - if I use my wet brush while it’s wet and she’s still in the bath - I can brush the tangles out so much easier! The wet brush has been clutch - I love it. Sometimes I do the Leave-in mask for a few minutes after combing her hair and after the shampoo/conditioner, as the last step before I do a final rinse. I also took Allysha’s advice on this too and use one of Chris’s white t-shirts to wrap London’s hair in. I used to towel it off and it would make it really frizzy from the start - but the t-shirt works! Then I use the smoothing cream. I start at the root and usually work the cream in all the way to the ends. Lo’s ends can get frizzy so I make sure I add a bit more of the smoothing cream on those. I let that set for a few minutes and sometimes I’ll finish it off with a braid or just let it air dry. First off, this oil smells SO amazing. It has olive oil, for frizz and to make hair look super shiny. I put a nickle-size amount in my palms, rub them together and them work it all through London’s hair - typically from the bottom-half down to the ends. I do typically braid her hair when she sleeps because it minimizes the tangles. In the morning, I’ll spritz it with a little water and add more of the Shea Moisture smoothie cream to bring her curls back to life! It seems like a lot of steps and sometimes it is - but we have it down to a little routine now and I feel like we’re getting the hang of it. If you have any more tips/tricks you’d like to share - please send them my way! I know a few people have recommended a silk pillowcase and I have one in my Amazon cart right now - I think that’ll help with tangles also. Anyway - I hope you found this helpful in some way! Have a great week! London and I leave for Charleston in just a few weeks!!! I’m so excited to have some one-on-one time with her and also to see Chris’s conference basketball tourney! Such a fun weekend! We are also heading to Florida at the end of March so I’ve been shopping for swimsuits, cover ups, maxi dresses, and all of the fun “vacation wear!” I wanted to share a few things I’ve purchased and also some stuff that I have my eye on. Can it just be summer already?! Cravinggg warm weather….we’re always to Spring! Ahhh! I am one of those people that really LOVE Valentine’s Day and all the hearts, all the pink, and all the red! What better week than this one to talk about our favorite thing ever: Toddler Discipline. HA! Kidding…Eww. I know. 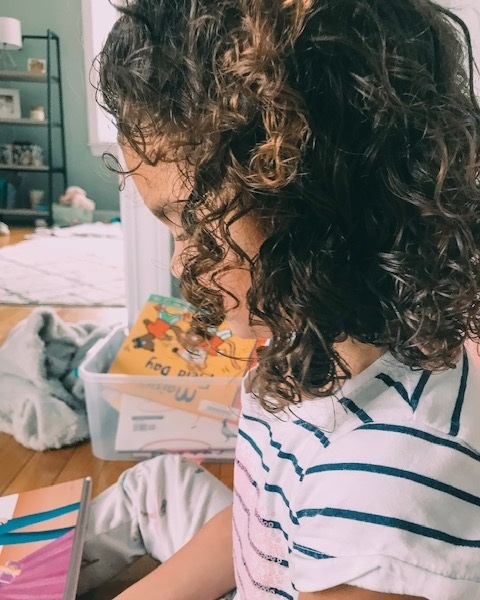 It’s not fun - but I’m writing this post in hopes that it can help other parents who may need a new strategy or who feel like they’re walking on egg shells around their “threenager” like we did! This isn’t sponsored by “1-2-3- Magic” … and I highly suggest you get the book to read it for yourself … but I just want to share WHY we started using the techniques discussed and how it has worked or rather TRANSFORMED our home. As parents we have always tried to be super consistent with every aspect of our children’s lives. We are consistent with their routines at bedtime, at nap time … we were consistent with potty training … we are consistent when it comes to the morning routine, etc., and it’s all good because it works for us. There was one area that we weren’t being consistent in and that was in our approach to discipline. (i.e. are we doing time-outs? are we ignoring? are we just talking calmly? are we distracting?) For awhile it wasn’t much of an issue because London always cooperated and listened fairly well. We used the “distraction” method as long as we could - but when London neared 3.5, I was feeling pretty helpless. I had tried different tactics but none of them seemed to be working. London was starting to do things like slamming doors and saying disrespectful things to both Chris and I. I know, she’s 3 and that comes with the territory (somewhat), but I really felt like if we didn’t nip it now, it would get worse later and MORE THAN THAT…I’m NOT okay with anyone slamming doors in my face. Even though our doctor said “just ignore it; it’s normal toddler behavior,” I didn’t really want to ignore it. It seemed like I was getting into these power struggles with this tiny human leading to more and more meltdowns. I had read a few books before this one about staying calm, ignoring tantrums, avoiding time outs and taking “time-ins,” speaking directly etc., some of which worked for half of the day… but by the end of most days, after I was exhausted from lectures and repeating myself, I would often lose my patience. I was raising my voice more often than I wanted, which never made me or London feel good. I was essentially crying to Chris every night when he got home and felt like I was failing at my “job” which feels absolutely TERRIBLE especially when your job is being a stay at home mom. I knew that we needed to find a way to fix this or we would all go literally insane! A few weeks back, I went to my alumni basketball weekend at the University of Maine and had the best time with some of my former teammates. A lot of us are now raising kids that are around the same age - and we started talking about some of the challenges that I was facing with London and the constant power struggles. That’s when my friend recommended the “1-2-3 Magic” book. I’m not going to lie, I was skeptical because like I said, I had read other books already that led me to lots of dead ends. After I listened to how it had transformed her household, I pretty quickly ordered it. Thank GOD I did. An important part to this whole thing being successful is NO TALKING on the part of the caregiver. THIS IS SO IMPORTANT and it was REALLY hard for me at first. I was so used to lecturing / explaining WHY we don’t do something or say something that isn’t kind etc. It is also my favorite part of the entire process because by eliminating the talking - my days instantly became a lot less exhausting. Just to give you an example of how this works…one thing that London would do that always seemed to DRIVE ME CRAZY was that whenever she got frustrated she would say “I don’t like you” to anyone that was around; could be me, a friend, her grandparents, a stranger … literally anyone. I tried putting her in time out anytime she said it, didn’t work. I tried ignoring it completely, didn’t work. I tried explaining to her that this hurts feelings and isn’t kind, DEFINITELY didn’t work … but for whatever reason - THIS WORKS. She has only said this once since we began this entire process - which is a major win! At this point ideally Lo would go to her room but if she doesn’t go on her own, I would calmly pick her up and put her in her room WITHOUT SAYING A WORD and start the timer for 3 minutes. When the timer is done I would go into her room and say, “timer is up!" and that’s IT. I wouldn’t lecture or explain why she got a time out … we start FRESH and move on like nothing happened. London is usually smiling saying “let’s read, Mom!” or even “I’m sorry Mom!” … it’s pretty amazing. The first example looks a lot like how things would have gone 2+ weeks ago before implementing this strategy. The second example is absolutely what happens now. Let it be known, I have definitely used this outside of our home as well. I’ve counted at the doctor’s office, at Target, at London’s preschool pick-up and in front of friends/family. If you’re worried about feeling embarrassed when counting in front of other people - throw that out the window. It’s pretty freaking awesome to be able to just say “that’s 1” to get your child to stop doing whatever it is you don’t want them to do. Our house is definitely a more relaxed place and just calmer overall. London was certainly craving consistency in the area of discipline and we were totally NOT fulfilling her needs. I think children really crave boundaries and the meltdowns that London was having were almost a cry for help. She was frustrated, I was frustrated … and now I feel like my girl is back and we are completely enjoying our time together. I wanted to share this with other parents because maybe you’re feeling a bit helpless like I did. Don’t lose hope. Parenting is really freaking hard…like REALLY hard. We are all just doing our best. Please take a peek at this book and let me know what you think. I truly hope it meets you where you are! As always, please message me here or DM me on Instagram and I will respond to you if you have any questions! Love y’all! Keep being amazing!! I have linked all of the items below each picture so you can click and shop - and I’ll put the prices as well because they’re super affordable! Sports Bra: Joy Lab ($20) / Leggings: Same as above! I personally LOVE Valentine’s Day - but Chris and I never do anything crazy or over the top. It’s an excuse for another date night, which we desperately need, so we’ll take it! We usually skip gifts and just grab dinner at our favorite restaurant. I thought it would be fun to come up with a few creative ideas for how to spend V-Day with your special someone this year! Here are some ideas / ways you could celebrate! Take a dance class. This is something I’ve been wanting to do with Chris because we’ve never done it and I think it would be a really romantic/fun wait to connect! It doesn’t have to be a weekly thing - but maybe just a “one-off” if there is a studio in your area offering one class or something! I’m sure around Valentine’s Day you’d be able to find something like this…maybe a little ballroom class or salsa?! I’d love to learn that with Chris! Go out for a dessert sampler date and champagne. Skip dinner, go to your favorite restaurant (or one with the best desserts) and order every single one off the menu! This is right up my alley since I loveeee dessert so much - and I think Chris would really enjoy this too. Throw a Galentine’s Day bash! This is my personal favorite and probably something I may do this year considering Chris will be on the road for work! Target has the absolute CUTEST decorations to throw the perfect party for your girls. It would be fun to have a hot cocoa bar and obviously champagne while watching the girliest chick-flick ever created. My vote would be “To All The Boys I Loved Before” on Netflix. If you haven’t seen it…it’s a must-see! I’m always curious to know if y’all celebrate this holiday - because I know some people who just skip it all together. What do you guys do?! Malia is still napping relatively well and sleeping through the night. We had about a week of bad naps and poor night sleep when she was sick with a cold, so it really made me realized just how spoiled we are by her amazing sleep habits on a normal basis. She is definitely able to stay awake longer before needing a second nap. I would say her wake times are about two hours…maybe 2 hours and 15 minutes. She is taking 2-3 naps a day, but typically still three with the third nap being the shortest a majority of the time. Her morning nap continues to consistently be the longest of the day (typically 1.5-2 hours), her second nap is anywhere from 45 minutes - 1.5 hours and her third nap, like I said, is about 30-40 minutes. (What can I say, this girl loves her sleep and I’m not complaining!) I’m sure in the coming weeks, we will have her nap just twice a day, but for now this seems to be working. Her bedtime is between 6:15pm - 6:45pm. We put her down awake at every nap and at bedtime and I’ve found she is much more aware now that she’s older. She fusses a little bit sometimes, but usually not more than 10 minutes before falling asleep. I highly recommend that if you do nothing else sleep wise, that you start putting your baby down awake around 2-3 months old. The longer you wait, the more difficult it will be and the more problems you will have. We basically sailed through the 4-month sleep regression because Malia was already consistently putting herself to sleep. The issues were extremely minimal and I know it was due to that. Trust me on this one…teaching them this skill is MAJOR and will help you so much in the long run! I consistently share what my girls eat for their meals on my Instagram and ALWAYS get questions about it - especially concerning Malia. I’m not an expert by any means but I’m just sharing what seems to be working for us! This section will be a little longer than the others, because I want to try to be as thorough as possible! Recently (like, in the past week) I have started to give her more solid foods to try. For example, this week she gnawed on some broccoli and I fed her little pieces of salmon and sweet potato. She loved it all! She actually ate quite a bit of salmon too! I typically put it all in a plate, but she hasn’t quite figured out that instead of smooshing the foods in her hand she can bring them to her mouth - so I help her with my fingers or a spoon. If I remember correctly, London started around 7-8 months using her fingers and feeding herself. I would say just experiment with it and have fun! Let them explore different textures and let them get messy! Try not to get too stressed (I know that’s easier said than done) but keep in mind it is SO good for them to just explore. I love making mealtime a production i.e. when it takes 20-30 minutes I’m thrilled! It’s an activity and it takes up time, so that’s a win! The brand that we love is BeechNut (this is not an ad) and we also do Earth’s Best. I usually get them at Target or the grocery store. Here are the foods that Malia has tried thus far (not purees): sweet potato, asparagus, avocado, banana, salmon, and broccoli. She has seemed to like all of it which makes me happy! I want to steam some carrots and also try zucchini with her next. I really like following @Feedinglittles on Instagram as a great resource! Lia has definitely been more interactive and expressive as of late. She is now in her stand-up activity saucer which keeps her entertained for a good 15 minutes at a time. She is starting to sit up unassisted which I’m so happy about. She seems to love books, especially ones with a “flap,” she loves to grab for toys/stuffies and of course she enjoys watching her big sister run around and play. She’s finding her voice and exploring all the ways she can make noises with her tongue and lips. It’s so cute to watch. I also just bought a bathtub seat for her which is seriously the best - and I’m so mad that I didn’t buy it sooner! I’ve been able to put the girls in the bath together this week and it’s made life so much easier! They both LOVE it. All baths have been 25-30 minutes long so that’s also a win. If I remember from London’s first year, SO much happens between 7-9 months and I recall loving those ages. Crawling is next and then comes pulling up and eventually walking - and I’m just so excited for it all. At the same time, I want time to slow down because I can’t believe my baby is already half a year old! It doesn’t seem possible. I hope you all have a wonderful weekend! Let me know if you’d like me to work on any specific posts coming up - you can comment on my latest Instagram post and I’ll see it there :) Love you all! I loveeee celebrating Valentine’s Day! I am a sucker for all the pink, red, hearts, and LOVE. I know a lot of people who feel differently about all the hype and don’t really celebrate it at all. To each their own! I do LOVE the idea of a fun Galentine’s Day party! What would be more fun than having a cute “girls night” in honor of the holiday to show your girlfriends some love! I think it would be soooo much fun! I’m sharing some gift ideas for the lovely ladies in your life and they’re all under $30! Enjoy! XO! You are already almost half a year old. It has been 167 days of “getting to know you” my sweet girl…and it has been every bit as glorious as one could imagine. I am going to cry through writing this letter to you, my very first one, but I want to be able to express all of the love I have in my heart for you! Before you were born it was just Daddy, your big sister and I. I was nervous about our dynamic changing and the big transition we would encounter when becoming a family of four. As soon as they placed you on my chest, every fear or feeling of anxiousness dissipated. It was like you had been with us all along. Every day from that moment forward you have continued to bless us with your sweet disposition and your contagious smile. You are truly the happiest baby and you make life EASY for me; for that I am eternally grateful. When we looked up the meaning of your name, “calm and gentle waters,” it could not be more fitting. You embody that in every way; you have a calming presence and an ease about you that is evident and always commented on by anyone that meets you. I am so blessed to be your Mom. I am sorry that far too often you get the short end of the stick when it comes to time and attention from me. The day gets bombarded with a never ending “to-do” list and your sister needs lots of love too. Thank you for being patient. So many times you’re watching me from the playroom while I’m running around the kitchen making dinner feeling like I should be reading to you or playing with you … and our eyes meet. You give me the sweetest side smile and time stands still. In that moment I feel like you really “see” me to my soul…and it’s almost like you’re saying “I’m ok, Mommy. I’m good.” Thank you for the unspoken understanding that you give to me. I live for your little smiles that melt my heart into a giant puddle. I was already someone’s mommy when you came into the world, but you made me a better one. Just know, you were the missing piece that completed our little family.